Our last class with sensei was full of the 遊び «asobi » feeling / playfulness that Nagato sensei talked about on Monday. But sensei precised that playfulness should not lower our level of awareness, though. Being « seriously playful » is what is expected from us during training. I opened the class with a kind of uke nagashi reaching out with the right arm to the left shoulder and back of uke in the moment of his attack. Sensei used this concept and added many weapons to it (tachi, bô). The best discovery was when sensei used a soft touch on the neck to take uke’s balance and then moved with the same hand to hook lightly the acromion hole of the left shoulder. The various information received by uke made him fall on his own each time. I was uke and it was brilliant! Powerful but soft. In a real fight, 実戦 jissen, sensei said that you can never be prepared. Therefore you must float on top of uke’s actions to control the space and counter-attack when the opening is revealed. This idea of « you can never be prepared » is something we should always have in mind, inside and outside the dôjô (ura-omote). Playfulness brings a state of relaxation that makes time go slower. When you are stressed you are tensed and when you are tensed you force things in a way unsuitable to the situation you are caught in. It also means that training is not the real thing and waza only a means to achieve body & mind coordination allowing you to see through things (kanroku 勘六). In this mindset your imagination (kaitatsu) is at its best and your movements, even if complex, flow naturally. Awareness is generated through self confidence that comes when you master your basics. Your body moves on its own adapting naturally to the changes in your environment. 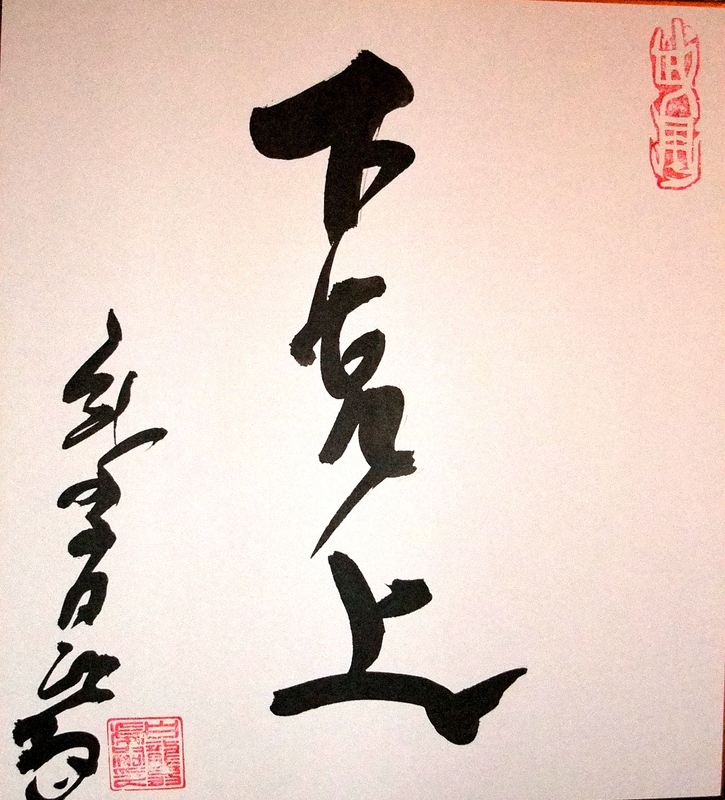 Then, during the calligraphy session sensei wrote gekokujô 下克上 for me. Gekokujô is a period of Japanese history, during the warring state period and the Ônin war. It is the end of the Muromachi period. At that time small daimyô tried to take over the power of the main daimyô. Translated it means: « the lower rules the higher » or « the low overcomes the high ». To use a comparison, a small tiny hole can drown a huge boat and bring her to the bottom of the sea. Many interpretations of this concept can be found in our training and our life. In training it means that rank does not protect you from defeat. To find success you have to develop luck. When you are lucky you can reach asobi. You can also experience gekokujô when the newly promoted high ranks try to impose their newly acquired power to those around them. From one week to another they become arrogant and disrespectful. And in life we see it when youngsters try to impose their lack of understanding and experience to their elders. In the « Republica » Plato speaks about a similar thing (book 7?). I don’t recall the exact words but it is something like: « when the children do not respect their parents, when the students do not respect their teachers, when the people do not respect the authority, this is the beginning of tyranny ». The best illustration is the so called cultural revolution in China under Mao Zedong. At the end of the class I am happy to inform you that India got its first « homemade » shidôshi. Arjun passed brilliantly the test with Doug. Both, emitter and receiver did a very nice sakki. After class it was touching to see how Shiva was proud of Arjun being “his” first Indian shidôshi. 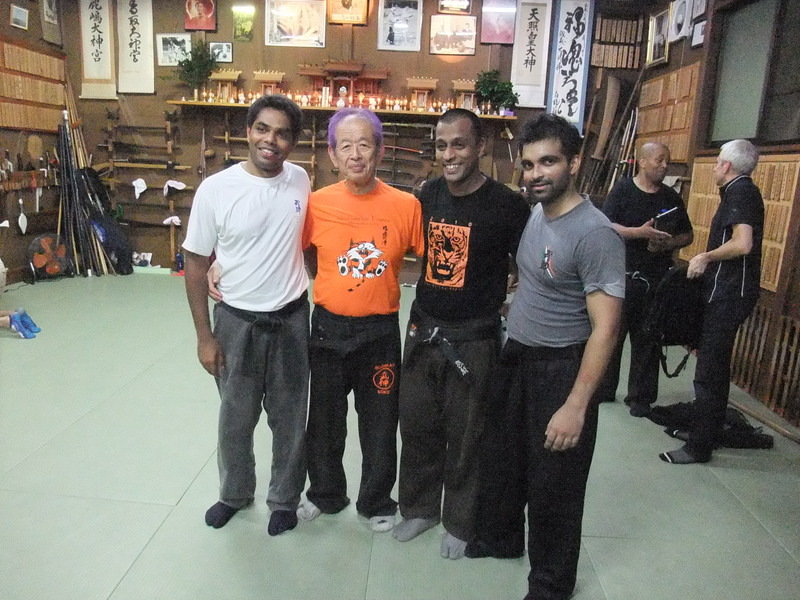 I guess that Arjun will honor Hatsumi sensei and Shiva in his new dôjô of Mumbai (Bombay). This is also the proof that hard training and good transmission of sensei’s philosophy are the key to our own evolution as human beings. The beauty of sensei’s teaching is to be found everyday more in the words and concepts he uses to develop our human abilities. His taijutsu speaks to our bodies when his words speak to our souls. Thank you sensei! It’s beyond random that the day before I read this, I was having an engaging conversation with a friend about how fear hinders us in doing things in our lives and that doing things repetitively develops confidence and the fear soon goes away. I replied that fear is like the shadows and confidence is like the light and when you turn on the light the shadows go away. Now, this morning I read this blog, and having enjoyed each of your Japan tidbits given on your trip, I find it beyond coincidence that you mention the self-confidence eminating from the mastery of the basics. These Budo basics are a mirror to life basics too. I have made a connection to how Ninpo training & living life build on each other. Thanks for the sharing of Sensei’s flow of thoughts on your journey.